When beloved actress Brittany Murphy died tragically and unexpectedly three years ago, producers of the last film she shot were left in limbo. Once the shock wears off, how do you market a film when your biggest star won’t be doing interviews and walking the red carpet? After finishing the film in an extended post-production process, the producers of “Something Wicked” have finally decided to tackle this issue and give fans of the late actress one last opportunity to see the star on the big screen. The film is now being shopped to distributors. Media interest in “Something Wicked” was predictably strong, with articles appearing in USA Today, The Los Angeles Times, CNN and Yahoo! Movies, among others. Producer Joe Colleran spoke with Bloomberg BusinessWeek about the process of marketing a movie when it’s surrounded by a tragedy. The film stars several up-and-coming actors, including “One Tree Hill’s” Shantel VanSanten and “Pretty Little Liars” and “Once Upon a Time’s” Julian Morris. The thriller about young love gone terribly wrong features superb performances from the young stars, lending the film depth and energy and giving fans more to celebrate. Ultimately, as Colleran points out, the film has to stand on its own merits, and not exploit the loss of a key participant. While Murphy’s fans will surely be satisfied, they’ll also be seeing a film that she, and they, can be proud of. Change Communications is excited to be working with the producers of “Something Wicked” and seeing the title on the marquee. While distribution is currently being secured, fans can visit the official “Something Wicked” Facebook fan page to stay updated and see exclusive photos, videos and more. The person who got our phrase did a fairly admirable job with it, but by the end of the game, our cute little phrase ended up looking like Michael Jackson circa “Thriller” wearing a piano on his head and riding a pony. Back in my day, when a fax machine was considered revelatory and we didn’t have iPads and Nintendo Wiis to tide us over, we used to play the ole game of telephone. You know, where you whisper one thing into someone’s ear, and they whisper it back into someone else’s, and by the end of it, an outlandish rumor is now ready to be circulated. 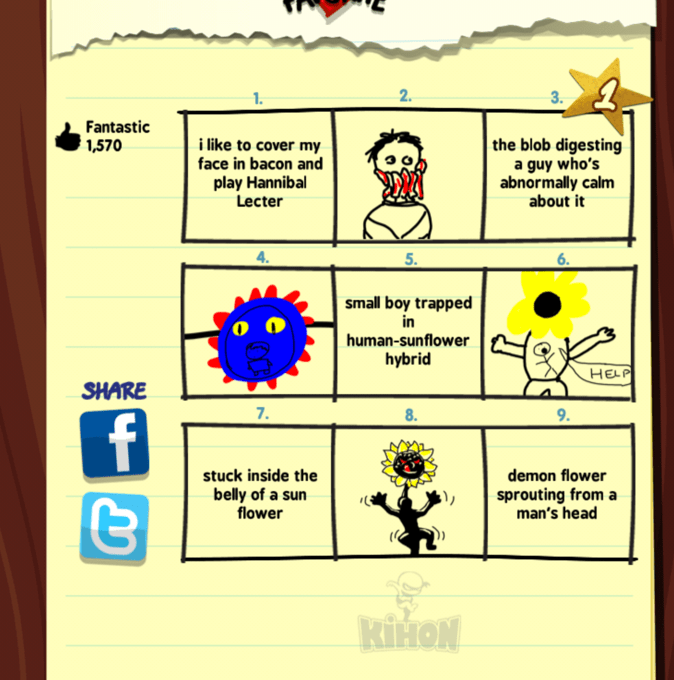 “SketchPhrase” takes this concept of telephone and plops it into a reimagined social drawing game for iOS devices. Drawing games are fun, but drawing games with your friends are even funner, and drawing games with your friends where you all end up creating some Frankenstein of a comic just because you wanted someone to draw a panda eating a hot dog is the absolute funnest. And yeah, we know funner is not a real word but neither is IDGAF and we’ll still use it. 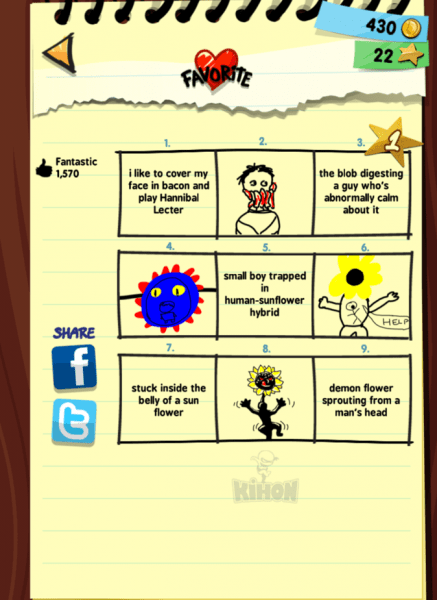 Kihon Games had been hard at work on “SketchPhrase” while simultaneously putting the finishing touches on their year-long masterpiece, “Dojo Danger.” “Dojo Danger” is aimed for an early January 2013 release. The two games have different genres but share the exact same formula as Kihon’s first game, “Baby Monkey (Going Backwards on a Pig).” And that’s to be the funnest game possible. Go download “SketchPhrase” for free at the iTunes Store, check out what 148Apps and Appolicious have to say about it, and send us your drawings on Twitter (use #SketchPhrase). p.s. If you watch the Parry Gripp-created trailer for the game, we guarantee you will not stop singing “SketchPhrase” while you’re playing the game, which may or may not hinder your abilities.